Taking a traditional fried catfish recipe that has been in the repertoire for decades and only changing the final cooking method, results in an easier to prepare at home meal for anyone who loves to eat fried fish. Back in the restaurant days, we would run through about 100 pounds of catfish filets every Friday, it was the featured fish. Served with hush puppies or French fries and this was always a sell out menu item! 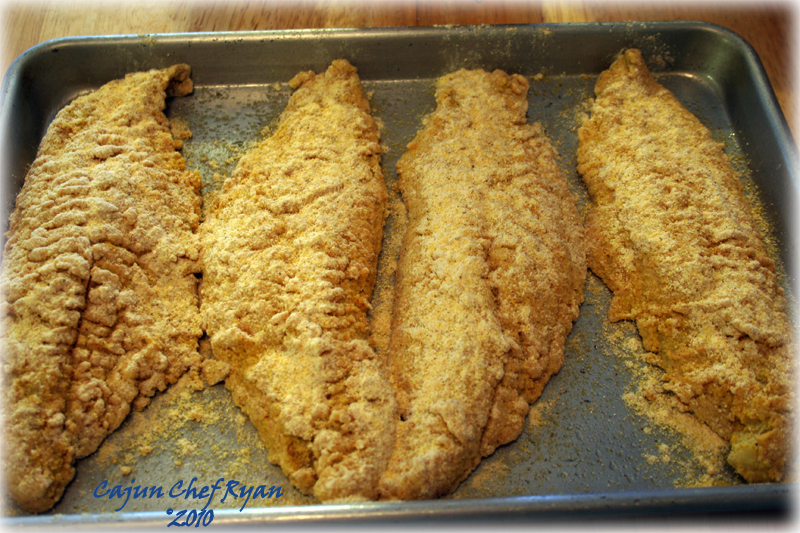 Using our yellow mustard, crushed red pepper flakes, and red wine vinegar marinade, then dredging the coated fillets in the seasoned corn meal and corn flour mixture creates the crispy crust coating that pleases most aficionados of fried catfish; this really is a crowd-pleasing fried catfish. The yellow mustard and red wine vinegar add a tasty twang flavor, sort of a hot and sour to the catfish, which permeate the tender flesh, then hidden beneath the crispy corn meal / flour coating provides an explosion of tongue tantalizing delicacy! Crispy crust on the outside, hot and sour catfish on the inside, this dish guaranteed to become one of those gastronomic sensations that are certain to add fond memories for you and your dining guests. 1. Combine the yellow mustard, red wine vinegar, crushed red pepper flakes, and salt in a large bowl, then mix well. 2. 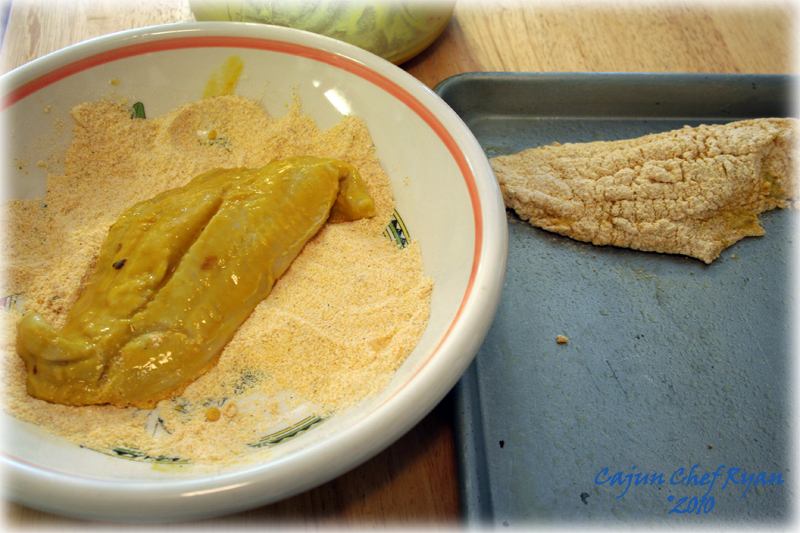 Gently add the catfish filets and coat them well with the mustard marinade. Allow to sit covered and chilled for several hours. The high oven temperature of 475° F ensures that the catfish filets get the same treatment as with deep-frying, yet without all the mess and bother of cooking with a large pot of hot oil at home! Steps for Coating and Baking the Catfish Note: Pre-heat oven to 475° F.
1. Combine all the coating ingredients into a large shallow dish or pan with high sides. Stir well to ensure that all the seasonings and the corn meal and flour blend well. 2. Lightly coat a sheet pan with the cooking spray, then dredge one catfish filet at a time into the coating mixture ensuring that all surfaces of the filet are well and evenly coated with the corn meal / flour mixture. Gently transfer the catfish filets to the cooking sheet pan with the flat side of the filets down. Make sure there is some space between the fillets, you want to ensure even baking, and inch or so of space should be good. 3. When all the filets are coated and panned, place them in the 475° F oven for 15 minutes. Then check on them, you may want to turn the pan around for even cooking, and continue another 5 to 10 minutes, or until they are browning on top. You know when ready, as they flake easily when tested with a fork. 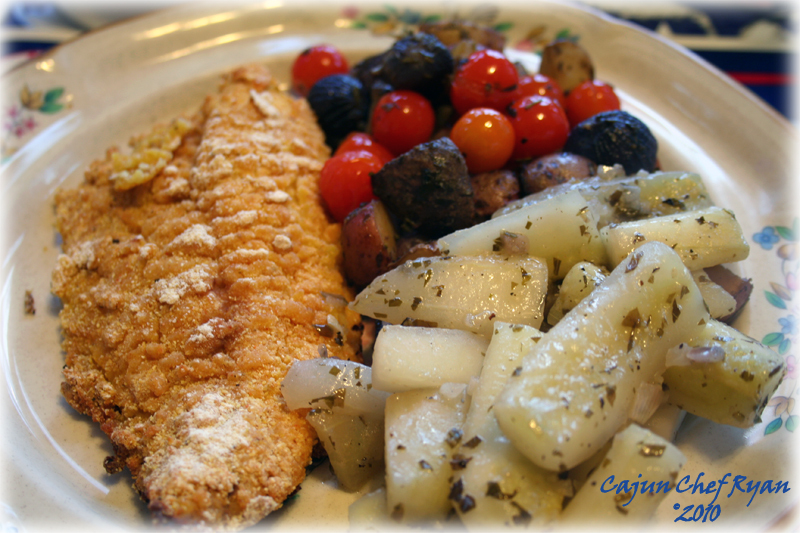 Dinner is served, the Oven Fried Catfish is accompanied with two sides which I will provide recipes in future posts, the Rockin Herb Roasted Potatoes, and the Braised Cucumbers. catfish is probably the fish i’ve had the most over my lifetime since my grandparents and some uncles had small catfish ponds. i love catfish and having it every imaginable way, and this dish looks delicious. i like the way you baked it in the oven, so oils do not dilute the spiced breaded layers. delicious! We love catfish here and your recipe is fantastic! I will definitely be trying this and all that corn meal and mustard in it is great. I posted cat fish today also but yours is definitely better! Thanks for the recipe! I never bread my catfsih. Just season with turmeric, coriander seed powder, garlic and salt, then fry it. Hohohho, you put seasoning that I like for your catfish, cajun spice blend! Nice!!! Hi Mary, it is the prepared yellow mustard, which is a condiment here, and I suppose is a bit thinner than a paste, but it is in liquid form. I like your addition of vinegar and mustard. They must add a nice zip. I love the idea of the tang to the fish under that corn meal covering. The catfish looks wonderful. Have you heard anything about the contaminants in catfish that are brought over to the US? I saw a video on a blog someone posted and it was a bit frightening. 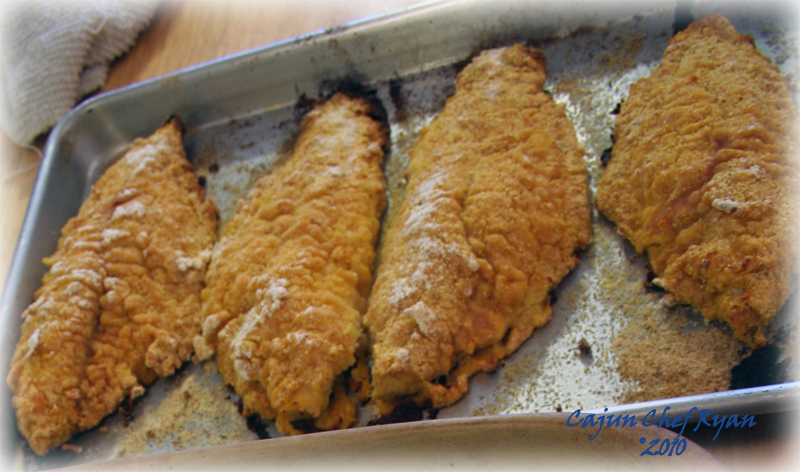 I love this baked version of catfish! It’s nice to have a healthier option of this tasty, crispy dish. 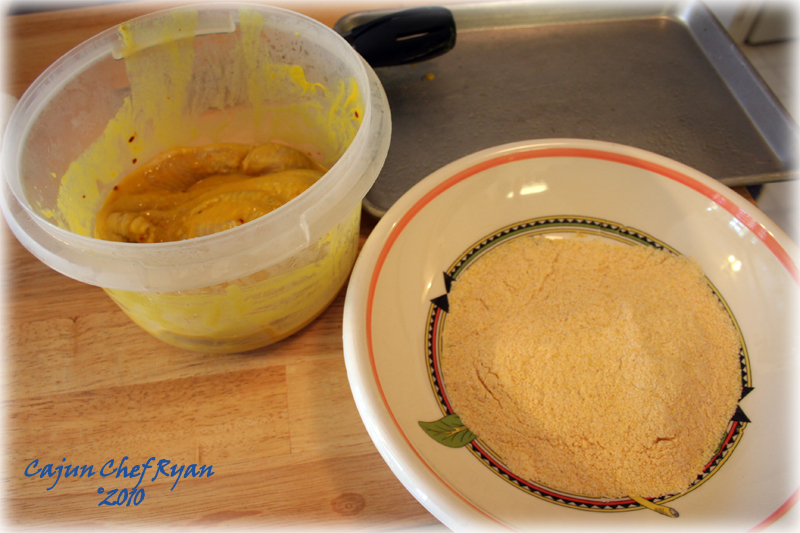 I am going to use corn meal for coating next time… YUM!! Sorry for publishing your comment that late! Thanks for your interest and support my dear! what great flavors for this fish! love the mustard! Yellow mustard, what a great idea. I bet that does give it a little zing. Looks delish. This looks great and I love that it is baked and not fried! Love it! The oven makes such a healthier alternative! You still get to enjoy the fabulous tastes, without the added fats! wow! Nice and healthy. will have to try this recipe! The Mom Chef, I am not aware of catfish from foreign country sources, most of the catfish I am aware of is farm raised in ponds here in the US, mainly in the Mississippi Delta region. Drick, you are right, some Dijon or Creole mustard would do wonders also, but yellow mustard is less expensive. For food cost budgeting in the restaurant, we went through a gallon or two of the yellow stuff every week just for the catfish on Fridays. Banu, welcome back, so glad to see you again! Claudia, how was your vacation? You’ve made my day, Ryan! I’ve eaten (and cooked) my fair share of fried catfish over the years and loved every minute of it. However, two of your innovations here — your delightful marinade and oven-“fried” approach — leave me stunned and amazed. What wonderful, must-try ideas! A terrific version of fried catfish, very crispy and delicious! I like the mustard in the marinade. Thanks very much for your answer to my question 😀 Would love to try one of these days. I need good fresh fish. With small kids in the house, the last thing I want to deal with is a large pot of hot oil, so this is a great idea!